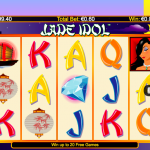 Jade Idol is a video slot game from Nextgen Gaming that allows us for a second to travel to the Far East. We have to admit that it would be nice to visit these exotic countries without the hassle of actually traveling. Most of the symbols are made to match the theme so we can find an ornate fan, a paper lantern just to name some. There are only 2 special symbols in Jade Idol, the wild and the scatter. The dark haired girl is the wild symbol and its function is to stand in for every other symbol except for the scatter to complete a winning line. 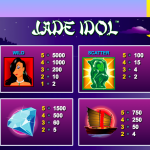 The Jade Idol is the scatter symbol and it is the key to the main feature, the free spins round. You can activate the feature with landing 3 scatter symbols for which you will receive 10 free spins, if you land 4 scatters you will receive 15 free spins and for 5 scatters you will receive 20 free spins. But that is not all when it comes to this feature, great news is that the free spins can be re-triggered and all the wins will be a subject to a x 3 multiplier. Jade Idol is an interesting and simple game. NextGen Gaming did that on purpose because they wanted to create a game where you can focus on the game play only. 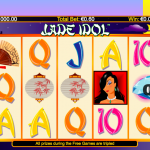 So it seems that Jade Idol is a great escape from all those complicated online slots out there. But that should not be a downfall for you, since this game has all the elements we are looking for in an online slot, a straightforward game play and special symbols and features that will bring some thrill in the first place. For another great engaging game you should consider playing Jackpot Jester Wild Nudge a 3 reel slot by NextGen.